But he recovers quickly. “Was that my fault?” he asks. Though he stands 6-foot-2 and weighs more than 300 pounds, Max Schlichter doesn’t have the handshake you’d expect. Thirty years ago, he grabbed a hunting rifle by the muzzle, banged it against the tractor he was riding and shot a bullet through his palm. Last year, bad weather and falling prices forced him to sell his farm so he could plant corn, soy and tomatoes on 4,200 rented acres. Back when his son was a National Football League quarterback, Max figured Art would one day buy the family farm. After lunch, Art stops by his brother’s house, where one of his little nephews comes to the door with a new, spiked haircut. The spikes take Schlichter by surprise. “You’re a farmer,” he says, “not a punk rocker.” He tosses a football with the boy, whose eyes take on an unmistakable glow. They used to call him King Arthur. As a Little League pitcher, he twice struck out 18 batters in a six-inning game. In three years as starting quarterback at Miami Trace High School, Schlichter (pronounced Shlees-ter) never lost. He was all-state in football and basketball. Encouraged by his father, who was certain Art would be a great athlete from the time he was four, Schlichter trained religiously. During the summer, to strengthen his arm, he would throw 2,500 passes a week. In one drill, he lofted the ball 50 yards, over an 18-foot net, while seated on the ground. Miami Trace is less than 40 miles from Columbus. The largest metropolitan area in America without a major league sports team, Columbus takes the fortunes of the Ohio State Buckeyes seriously. Downtown, across from the State Capitol, is a hundred-year-old church with a huge stained-glass window above its front door; pictured in the window is Ohio Stadium, home of the Buckeyes, former home of Woody Hayes. The legendary coach, who was revered in Columbus long after he resigned in disgrace, won his first national championship at Ohio State six years before Schlichter was born. By the time Schlichter reached high school, Hayes, who died last year, had immortalized his plodding three-yards-and-a-cloud-of-dust offense and his coaching creed: “When you throw a pass,” he loved to say, “only three things can happen, and two of them are bad.” Together, Woody and Art would discover a fourth thing. King Arthur had his own fan club. He had to move out of his dorm because girls he’d never met were knocking on his door all hours of the night. A warning bell has sounded in Schlichter’s car. It’s a noise he’s never heard before, but it might have something to do with the light on the dash that keeps flashing: “A/C System Problem.” The car, an Olds Toronado, is covered with dirt and dust. Its seat belts—“Nobody ever uses them”—are buried somewhere beneath the trash, the official CFL football and the pile of newspapers. “I like to read the paper while I drive,” says Schlichter. Seated nearby, watching the Cubs game, is an OSU alum and occasional golfing partner of Schlichter’s named Billy. “Are you making any money?” Art asks. “I hear you’re getting married,” says Billy. Billy reminds Art of a certain night they spent at the track. They grin, then start to laugh. “Do you remember that night?” asks Schlichter. “I think my parents were there that night.” They laugh louder. Suddenly, the center screen goes blank, and, as if in a dream, the face of Woody Hayes appears. Schlichter sits up straight. “This is great!” he says, turning up the volume, as Hayes stamps angrily toward a cameraman. “Watch Woody! Watch Woody!” The coach unleashes a hook, and the picture spins out of control. There’s also a clip of Woody in a locker room, doing his best Knute Rockne, first telling the Buckeyes that the team that wins today will be the team that hits the hardest, then leading a wild, frothing charge onto the field. “I still get chills,” says Schlichter. On his way out of the bar, he stops at the men’s room, where there’s a guy standing at a sink. “There’s no soap,” the guy warns. “I’m not washing my hands,” says Art. Schlichter never won the Heisman. While he dreamed of dropping back and launching bombs, Bruce kept calling option plays that took advantage of Schlichter’s speed and running ability but left him battered and unprepared to run a pro offense. The quarterback quietly seethed. He even considered transferring, but the bond with Ohio State was too strong. His junior year ended at the Fiesta Bowl, where he passed the Buckeyes to a 19–10 halftime lead over Penn State. In the second half, Bruce went back to the run, and Ohio State lost, 31–19. Afterward, Schlichter and his dad—who, unlike Art, was openly critical of Bruce—went to a dog track. Bored, frustrated and never one to lose himself in his studies, Schlichter started spending more time at the track. Even when he was in high school, he had played the horses once or twice a week. Now the wagers started small, but his dad’s farm was doing well, he had the promise of a pro contract, and gambling was the only thing he’d found that could match the high of playing quarterback. The amounts grew. The day before an OSU-Michigan game, he and two teammates won $1,500. The amounts grew. The day before an OSU-Michigan game, he and two teammates won $1,500. He didn’t win many. When he lost, he made larger bets. When he lost again, he got the money—from friends, from acquaintances, from banks. How did he get it? He asked. Bill Hanners: “He sent me one time to one of the banks where he knew my face would be recognized, with three checks, one for $10,000 and two for $7,500 each. He sent me down there to cash them, and I walked out with $25,000, and he flat out did not have the money in the bank. He had called the president of the bank, who had watched us grow up, and said he would transfer the funds in. I couldn’t believe it. I walked out with $25,000.” The money was never transferred. Some of the money came from his family. “He was taking money out of his dad’s farm account,” says Hanners. “He had put a lot of his bonus money into an account for the farm. Behind his father’s back, he drained it out. That was always on his mind.” Sometimes, Schlichter asked his father directly. “Arthur,” his father told him one time, “I’m giving you this money, and it’s just like taking a part of your mom’s body, because this is the insurance money we got when your mom had cancer.” Art took it and swore he’d never gamble again. And he didn’t—for a week. Schlichter went to the FBI. 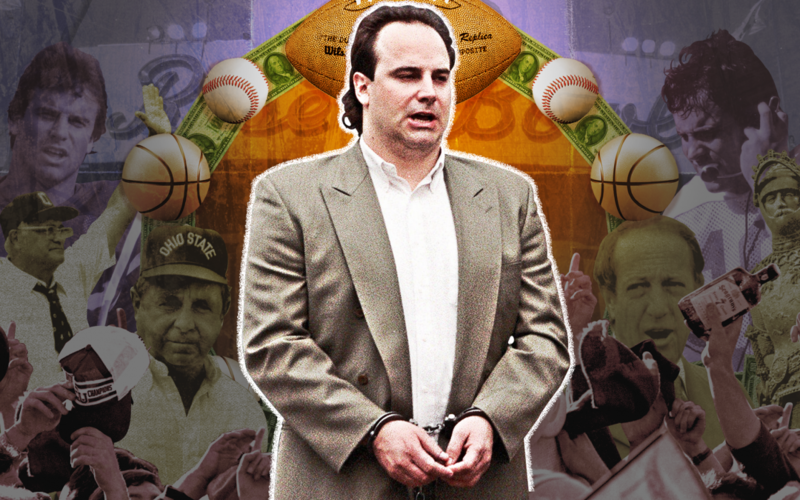 A sting operation was set up, and on April Fools’ Day, 1983, his bookies, lured to Columbus by the promise of an $80,000 payoff, were arrested at the airport—just outside a store displaying a mannequin in an Art Schlichter jersey. In Columbus, there was much speculation as to whether Fred would live to tell his story. But it turned out the bookies were amateurs who weren’t even laying off his bets. Most bookies share the risk; these guys were keeping Schlichter all to themselves. They had found a stooge, a sure thing, a gambler so bad, so frenetic, so illogical, it was almost impossible for him to win. On those rare occasions when he did, they put off paying him and convinced him to gamble some more. They knew he’d lose it back. For Schlichter, learning he’d played the fool was humiliating, but it was better than having his arm broken. This time, it was Schlichter who got stung. When an Indianapolis prosecutor broke open a betting ring, one of the names that turned up was Schlichter’s. Perhaps looking for publicity, the prosecutor chose to arrest the former quarterback. Hanners got the call, too. “What size bed are you looking for?” asks the salesman, a thin, dark man with a pencil mustache. Schlichter’s mouth opens, but nothing comes out. “King? Queen? Double?” asks the salesman. “You sound like a car salesman,” says Schlichter, not without respect. It seemed a good match. Schlichter, still only 28, went to Ottawa figuring he’d get some playing time and then maybe one last shot at the NFL. Desperate for star appeal, however tarnished, Ottawa promoted him heavily. The Rough Riders, long the worst team in the Canadian League, were struggling to revive the franchise amid rumors that the team or even the league might fold (things have gotten so bad that two of the eight teams share the same name: the Saskatchewan Roughriders and the Ottawa Rough Riders). On the field and off, Schlichter, people kept saying, just looked like a quarterback. He started well. Playing half of the last exhibition game, he stirred hopes by completing all nine of his passes for 150 yards. Open and gracious with fans and the press, he quickly won the city and the starting job, but he didn’t win games. Though he threw well at times, he got little protection, and the Riders lost badly. Fearful for his job, the coach, Fred Glick, the guy who’d really wanted Schlichter, panicked and benched him. (Glick was fired anyway, replaced by his brother-in-law.) Though Schlichter stayed on the bench, his teammates publicly proclaimed him the team’s leader. When the losses continued, the fans took to chanting, “We want Art! We want Art!” Eventually, he demanded to be played or traded. They played him. He didn’t do badly, but the Riders lost, and after two games of repeated sackings, he went on the disabled list with bruised ribs. Schlichter, who immediately retained an agent to put out feelers in the NFL, remains hopeful. “He has to believe in himself,” says George Chaump, the former OSU assistant. “If there were some magic where he could regain that attitude…” Still, he has considered his possibilities. He’s good with kids and might try coaching; he’s done some sales work for an Ohio sports equipment firm called the All American Company; he and Mitzi have discussed opening a Physicians Weight Loss Center; and there’s always VanLand. Of course, returning to Columbus does have risks. When he left for Ottawa, Schlichter said he knew it was time to get out of town. Too many old friends. Too many old habits. Does Hanners know if Schlichter has such a closet? After he was cut, Schlichter and Mitzi, who plan to marry in January, rented a trailer and packed up their stuff for the trip home, back to Columbus. Art figured he could do the 700-mile drive in 11 hours.